There are many different books for sale, as well as online resources, that have the purpose of helping those with social anxiety and/ or shyness, but some are better than others. 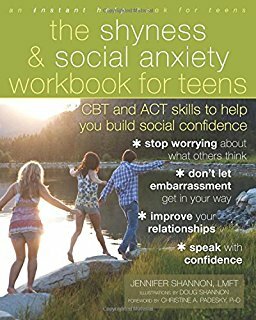 After reading “The shyness & social anxiety workbook for teens” I felt quite refreshed as this book isn’t worded to over complicate anything. I think the best way to explain and describe this book is: teenage friendly. It doesn’t need to be read all at once nor does it have to be read it in order. It’s written in a very flexible way; you have the option to pick and choose which topics you read about and when. I feel this workbook has a pleasing balance of being both engaging and informative. One of the most useful and important focuses in this workbook, in my opinion, is how it takes common thoughts that have been affected by anxiety and helps you to rationalise them. Over all I generally think this book is great for teenagers who are letting their shyness or anxiety make decisions that they themselves wouldn’t necessarily make, such as avoiding people they want to talk to. I enjoyed reading this book and felt it didn’t take much reading into for me to grasp the understanding that nobody is alone with struggling with social anxiety. Anxiety is common, but it can affect us all in different but similar ways. I was really pleased to see how much this workbook focuses on the reader and gives them the opportunity to engage by placing themselves, or their mind, in the different anxiety provoking situations mentioned. I think it’s a huge advantage to read though this workbook; I like how it encourages the reader to think about ways to overcome their barriers. I think this workbook gives you plenty of opportunity to involve personal situations, but on the other hand it isn’t compulsory nor does it come across too forceful. I really like how it gives you various examples of common problems associated with struggling with shyness and social anxiety, which indirectly allows you to place your own situation into the matter. I was also happy to read examples of both males and females struggling with different common anxious situations, from toilet anxiety to anxiety around speaking. There is a positive focus on the difference in how we as unique individuals react, behave and think slightly differently to one another due to our personalities and values. It’s reassuring to read this workbook and see that the aim is not to change who you are, but to change how you deal with your anxiety. In my own opinion, I think this book is definitely worth your time and effort. Tricky Tongue Twisters for Afasic!